Roger Staubach is a football legend. You may know he coined the phrase “Hail Mary Pass”, but did you know that he is also a Navy Veteran? Staubach is the last member of the Naval Academy to have won the Heisman Trophy and the first player to win both the Heisman and Super Bowl most valuable player. Diagnosed as color blind, Staubach was prohibited from serving in many Navy line officer commands so he became logistics officer. 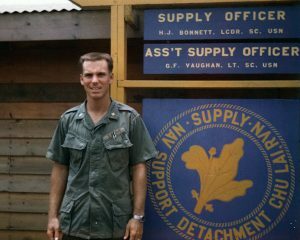 At a time when many young men were doing everything they could to avoid the draft, Staubach volunteered to go to Vietnam. Staubach and his Naval Academy team mate Fred Marlin were the only two members of their SERE class to escape the mock POW camp. While he could have avoided his Navy commitment in order to play football, Roger Staubach believed he had a commitment to his nation first and football second. When football recruiters broached the subject to his mother, she threw them out of her house! Staubach used his military leave to attend the Cowboys rookie camp and began his professional football career as a 27 year old rookie. However, he believes that the leadership lessons acquired in the Navy contributed to his success as a quarterback. Having already suffered 20 concussions, Staubach declined a two year extension with the Dallas Cowboys and began a successful career in real estate. He is currently the Executive Chairman for Jones Lang LaSalle Americas, a real estate services company managing billions in assets. Roger Staubach has also dedicated himself to charitable works, both with his Staubach Family Foundation and the Allies In Service nonprofit. Allies In Service principally focuses on helping Dallas-Fort Worth area veterans find employment. My surprise revelation from this interview? One of the best quarterbacks to play pro football didn’t begin playing the quarterback position until his senior year of High School.